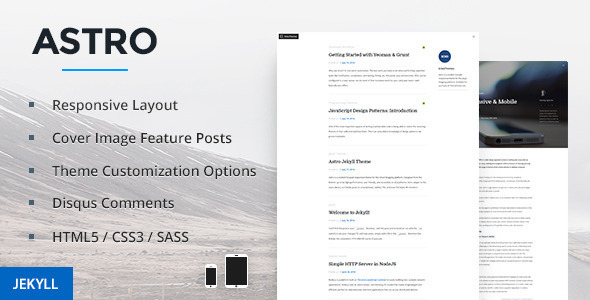 Astro is a content focused responsive theme for the Jekyll blogging platform. Designed from the bottom up to be high performance, user friendly, and accessible on all platforms. Astro adapts to the users device, so it looks great on smartphones, tablets, TVs, and even the latest 4K monitors. Taking advantage of the Jekyll platform, Astro has two different post styles. The standard style is great for smaller update posts and short articles, while featured posts have full page titles with image backdrops, which works great with large articles, tutorials and other documentation. Designed for Mobile, Tablets, Notebooks, and Desktop Devices. Astro will dynamically adjust to any devices viewport. Enable/disable theme features by editing a simple configuration file. Navigating large articles is made simple with the floating article bar which activates as you scroll down the post. It will update to show the current header section. Astro will be updated regularly to ensure it is compatible with future versions of Jekyll. This theme has currently been tested in version 0.3.3, and the latest 0.4.0 build. The documentation included provides all the information needed to get the theme installed and customized. However, if you have any questions you can email support@ecko.me, and we will be happy to help. This entry was posted in jekyll, static-site-generators and tagged article, astro, blog, clean, code, content, customizable, ecko, Jekyll, minimal, responsive, simple, social, theme by Acty. Bookmark the permalink.